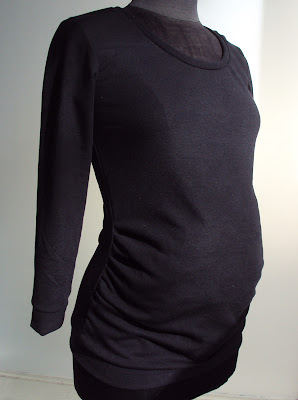 Two weeks ago I posted about some maternity jersey tops I made for a lovely lady who currently has a bun in the oven. 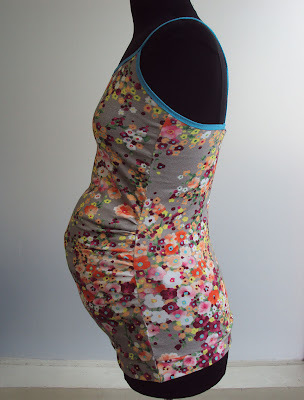 I said that, if enough people were interested, I'd be happy to make a tutorial on how to adapt a jersey top pattern into a maternity/pregnancy friendly one. A lot of people voiced a desire to see such a tutorial, so as promised here it is! Aside from the glow of knowing I could share some sewing knowledge that would help others, that post also made me really happy when I got a few comments from lovely ladies saying how much they would have loved to have receive the pregnancy tops I made Emily when they themselves were pregnant. I hear from my friends and acquaintances who have been pregnant how poor the selection of clothing available for maternity can be, unless you have a lot of money. I'm all for wardrobe self-sufficiency, so if this tutorial can help a few women alleviate a couple of wardrobe head-aches during a time that is apparently to tricky to dress through, then I'll be very pleased. The pattern alterations I'm describing here are to materni-fy fairly fitted jersey tops, so close fitting T-shirt styles like Burdastyle's Lydia, Sewaholic's Renfrew or my very own vest/camisole/singlet pattern are all good starting points. Now, I've never been pregnant myself, so I've only got my friends' word on how their bodies changed during pregnancy to go by. So, from what they say, I'd recommend starting with a size larger or half a size larger than you made/would have made before you (or whoever you are making this top for) were pregnant. This will accommodate for the fuller bust, hips and so on that usually accompanies the expanding bump. For this tutorial I used my downloadable vest/camisole/singlet pattern. I had in mind a pregnant friend who used to wear UK size 10-12 before her pregnancy, so I started with the size 12 on the pattern. Please note: every body is different, and I'm certainly no expert on the variety of pregnant ones! Please use this tutorial as a guide rather than gospel. You may find your (or whoever this top is for's) bump may be higher/lower/larger/smaller than the garment produced from these instructions can suitably accommodate. Therefore, you may need to make some changes to the instructions below and try again before you get a successfully fitting garment. Do leave a comment below to let us know how you got on, it may help out others who are giving this a go. Hold your front pattern piece against your body and figure out where your natural waist line is on the pattern. 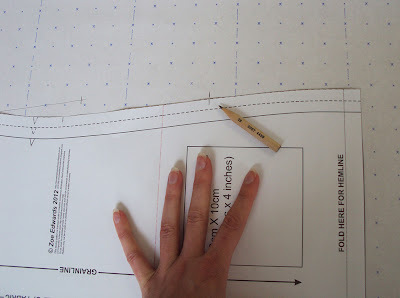 Make a pencil mark on your pattern 5 cms / 2" above your natural waist line on the side seam. Make another mark 14 cms / 5 ½" below the first mark. 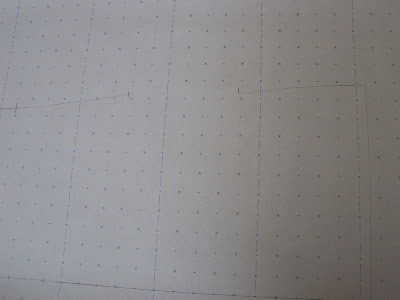 Transfer those marks onto your back pattern piece at the corresponding point on the side seam. Get a piece of pattern cutting/drafting paper (the back of wrapping paper, grease-proof paper or baking parchment can be used if you don't have pattern cutting paper) and draw in your centre front line. Line up the centre front of your pattern piece on the line. 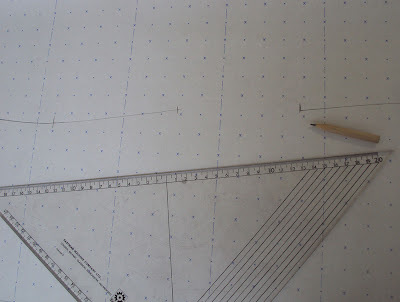 Make sure you have extra space on the paper at the bottom of the pattern. 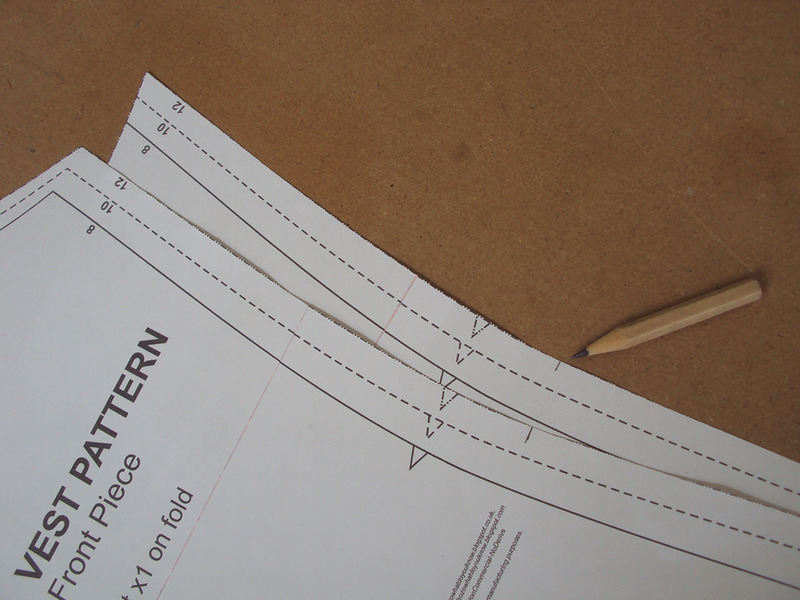 Trace round the top of your front pattern piece until the lower side seam mark. 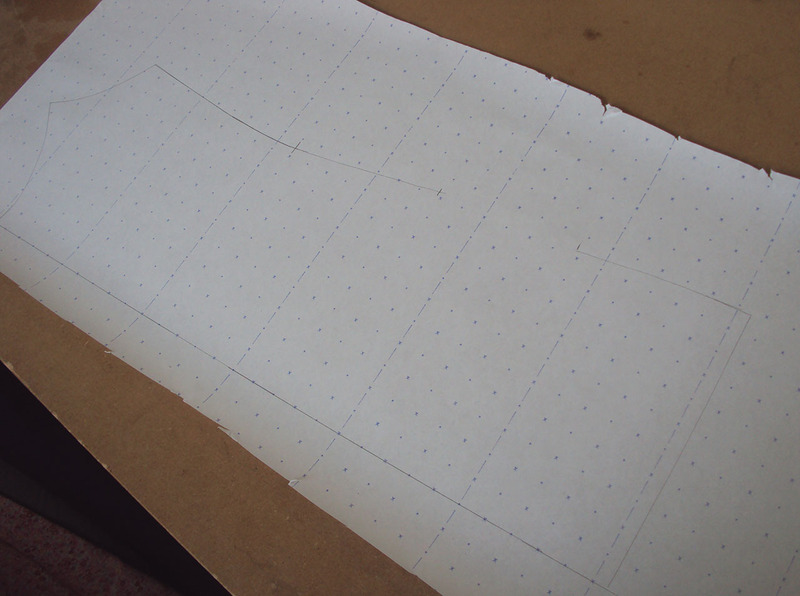 Make both side seam marks on the pattern paper. Remove your original front pattern piece. 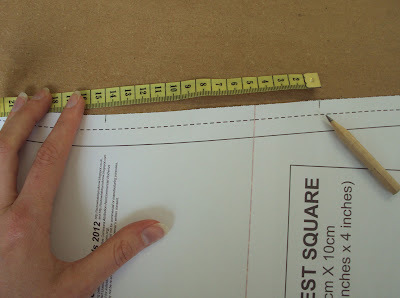 Measure 12 cms / 5" down from the lower side seam mark roughly parallel to the centre front and make a third mark. 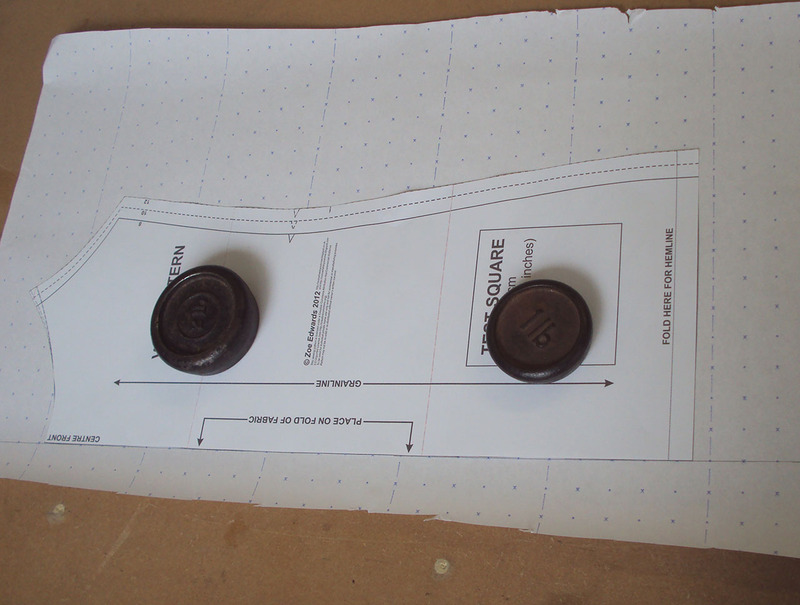 Place your original front pattern piece back on your paper, making sure both centre fronts are matching up. 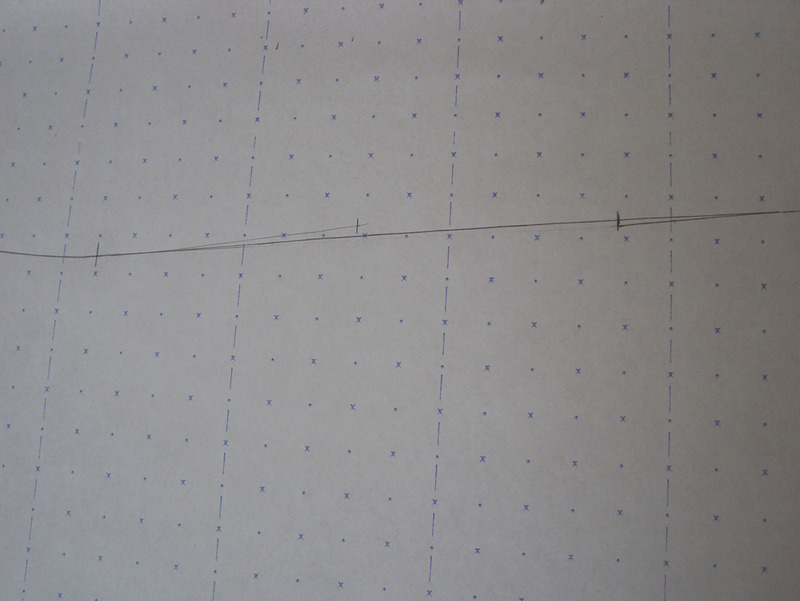 Align the lower mark on your original front pattern piece with the new third mark on your paper. Draw round the original front pattern piece from the lower mark and around the bottom of your pattern. 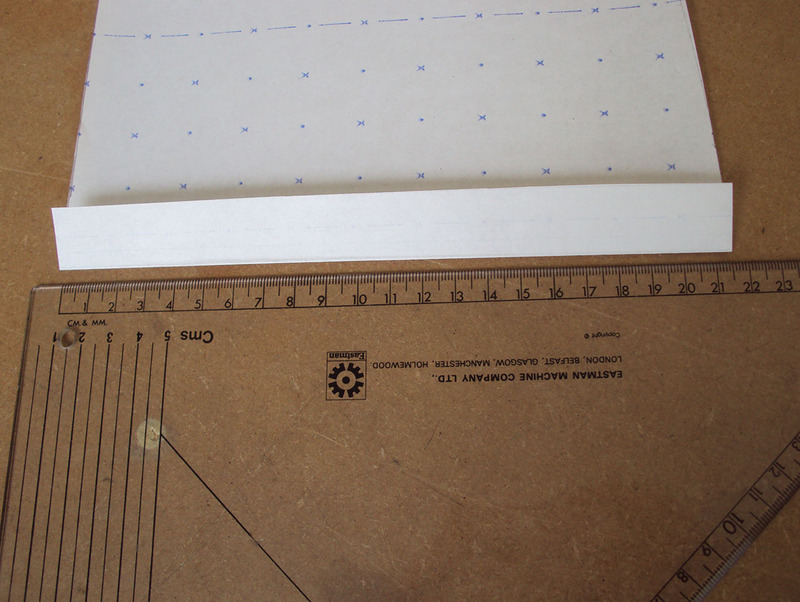 Remove your original front pattern piece from your paper. 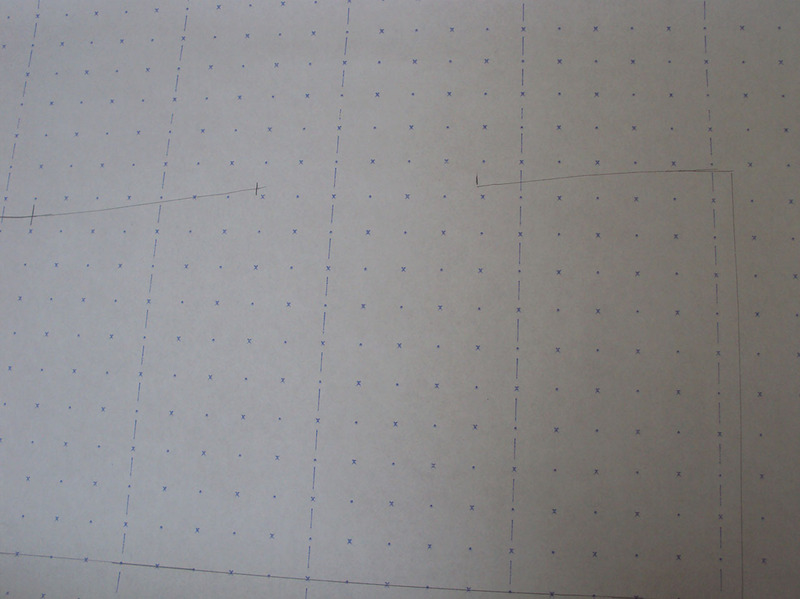 Your side seam should now look like the picture below, with three marks and a gap between the lower two marks. If you simply draw a line between the two lower marks, your side seam will look crooked. You need to make a smooth line with a gentle curve. See in the picture below, to make my side seam into a nice gentle, smooth curve, I actually started my extended line at the side seam before the middle mark and ended it at the side seam below the lower mark. When you are happy with the smooth line you have created, erase the middle mark and any confusing lines which are messing up your new side seam. If you bring your original front pattern piece against your newly drafted maternity front pattern piece to compare them, the difference should look like the picture below. 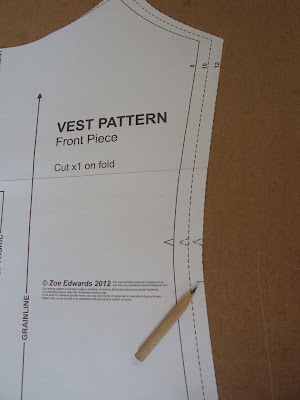 Your new front pattern piece is now obviously considerably longer than your back pattern piece. 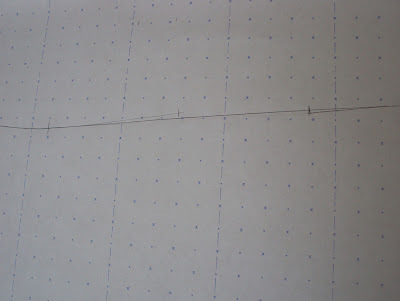 This difference of measurements is contained between the two sets of marks (you have an upper and lower mark on the side seam of both your front and back pieces). 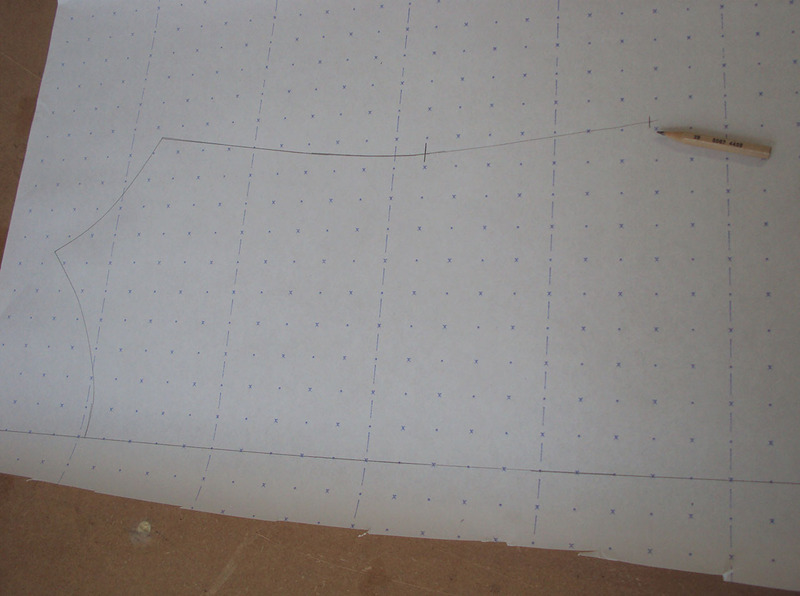 Begin stitching your side seams from the top and stop when you reach the first marks. Now you will need to gather the extra front piece fabric into the distance between the marks on your back piece so that your lower marks can meet and you can finish stitching the rest of the side seam to the hem. You may wish you create 'tram lines' of wide straight stitch within the seam allowance between the two marks on the front piece and gather this section before you begin stitching the side seams. Or you may choose the more renegade approach like me and create the gathers by eye by pushing the extra front piece fabric in with your fingers as you stitch the side seam. Alternatively, you may prefer to create little pleats rather than gathers to feed in the extra front piece fabric. Now to make the band that attaches to the hem. This band is not essential and can be omitted if you wish, but it really helps to keep the hem of the top under control underneath the bump, it stops the garment from riding up and generally gives shape to the whole garment. Plus, the band will stop the hem of your top from getting misshapen or baggy quickly when the garment gets taken on and off repeatedly. 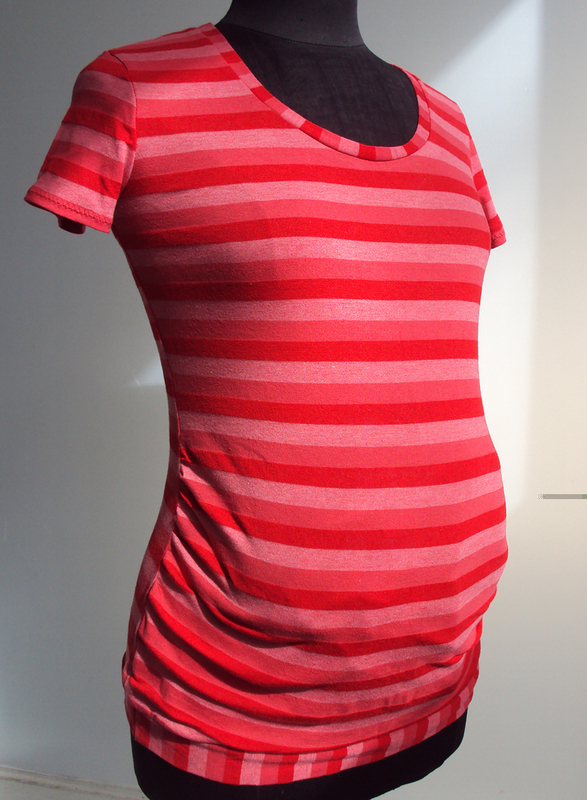 The additional band will make your top a bit longer than the original pattern intended, which is probably a good thing as a maternity top that is a bit short probably isn't going to feel very nice or be very practical. But exactly how much longer you want the maternity version to be is, of course, up to you. Because the original vest pattern I have been using is a quite a long length already, plus my pregnant friend is quite petite, I opted to fold back the hem allowance of the original vest pattern before adding my band so the overall length will only increase by a small amount. The band is made from one long rectangle and is cut from the jersey fabric so the least amount of stretch runs lengthwise (usually along the grainline which runs parallel to the selvedge). 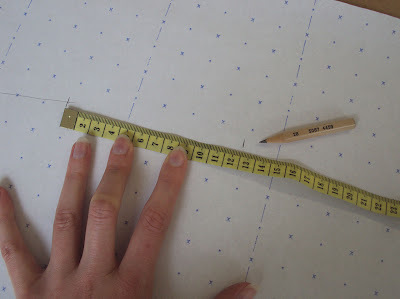 To figure out the length of your hem band, measure the bottom edge of your front pattern piece, minus the seam allowance. 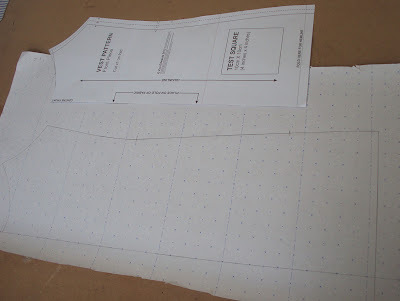 Then measure the bottom edge of your back pattern piece, minus the seam allowance, and add it to the front measurement. 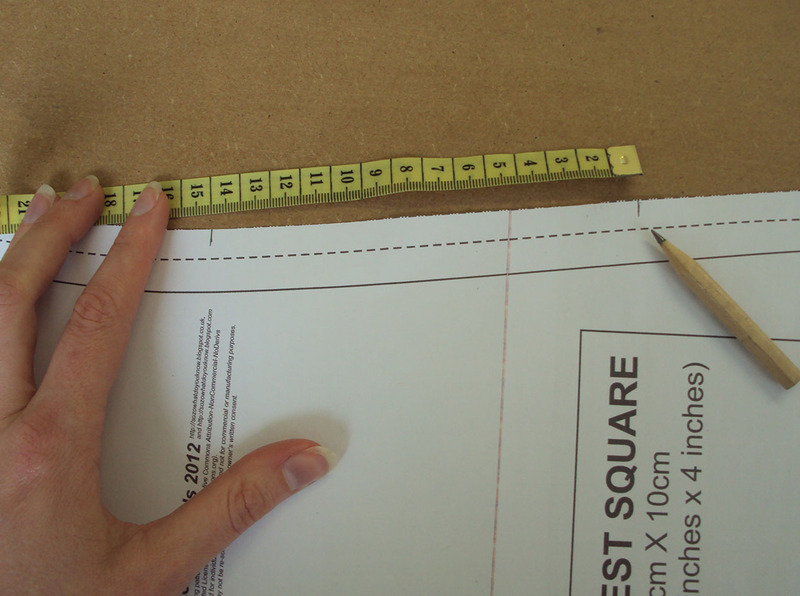 Multiply this figure by two to get the total length of your garment hem. Next, minus 4 cms / 1 ½" which makes your band a bit smaller and therefore tighter than the bottom of your garment hem. Then add two seam allowances so you can stitch it together on one side. For example, the seam allowance of my vest top is 1 cm, so I added 2 cms. 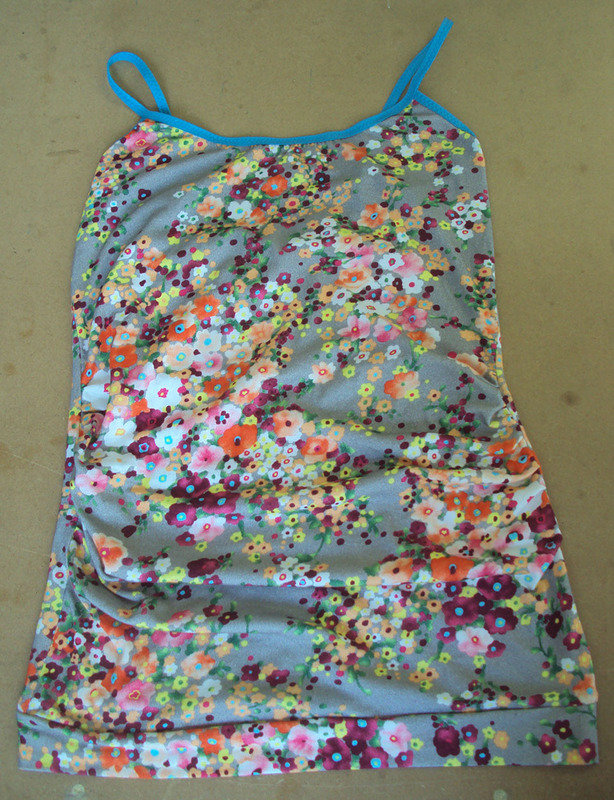 To construct your top with a band at the hem, stitch one side seam together, but leave the other open for now. Then fold your band in half along the length and pin it to the bottom edge of your garment at the beginning and end, against the right side of the bottom edge of your top. Find the midway point of the band and pin it to the side seam point on the top. Add a few more pins in between if you wish to secure the edges together when you sew them. Because the band is slightly shorter than the length of your garment edge, you'll need to stretch the band slightly as you sew to ease them together leaving no excess garment at either end of the seam and no pleats or tucks along the seam. Now your band is attached to the bottom edge of your garment, you can stitch your second side seam together, which will bring the band ends together as well as part of that seam. If any of this doesn't make sense, or you'd like to add anything you think would help someone trying this out, please leave a comment. Good luck and happy materni-sewing! Thanks for sharing this! I just found out that I'm going to be an aunt, so I'll have to make a couple of these for my sis! Wow! Excellent tutorial! Wish I had something like this available when I was pregnant... for next time :) Thanks for sharing! Thanks Zo! Am 19 weeks now and will whip up some sleevless and sleeved versions of this for the winter this weekend! THANK YOU ZOE!! I'm so excited about this tutorial. This is going to make life so much better for so many bump-sporting ladies, myself included! Hooray! Thanks so much! Your instructions are so helpful, and the finished product looks very similar to one of my favorite maternity tops. I'll have to whip some up soon! I found your tutorial recently and used it to make myself a couple of maternity Renfrews. Thank you very much! They're now my favorite maternity tops. I'm not pregnant but I will have to keep this in mind someday as it's a lovely idea! Where is the floral fabric from? I'm enamored with it. Thanks for this! I'm 6 months pregnant and needing some clothes with room for my bump. I'm going to copy an RTW maternity t-shirt but it's a great help to see how someone else has done it, with such clear instructions. Thats for the walk through. I think I'll be living in these soon! This is so helpful! Many DIY clothing tutorials online are refashions or "no-sew" options for people who don't really sew, so this is nice. I do have a question. Do you have any advice on drafting a brand new pattern strictly for maternity? I don't have a pattern for a top that I already love, and it would be easier for me to draft a new pattern from scratch. Any advice? Thanks! Great tutorial, thanks! Just made 3 tees for myself using this method and it worked a treat. Thanks for sharing your knowledge. Thank you! Am I reading this correctly that you didn't need to add extra width, only length? do you think this would work if you created a channel and sewed a drawstring into it to allow you to adjust the gathers if you needed to? I'm not currently expecting but we are planning another one very soon hopefully so it would be great to be able to make maternity wear that doesn't cost the earth!